Looking for that perfect rich chocolate fix? 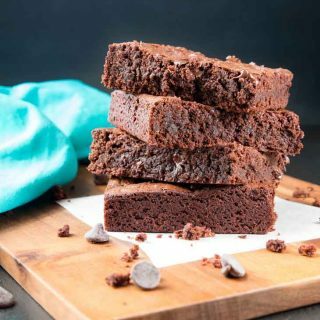 This vegan brownie recipe is pure indulgence! It has chocolate melted straight into the batter to create a wonderful texture and comes complete with a gluten-free option. The only problem you’ll have is wishing you made double the batch! Richa Hingle, the award winning recipe developer, blogger, and photographer behind VeganRicha.com, just came out with her second cookbook ‘Vegan Richa’s Everyday Kitchen’! I’m beyond thrilled and have been waiting to get my hands on a copy of it! Her new cookbook is filled with mouthwatering recipes and gorgeous full-page photographs. Richa has already won me over with her recipes and two beautiful cookbooks, and if that isn’t enough, she’s become an awesome friend over the past few years and is a genuine, kind-hearted, and positive person. 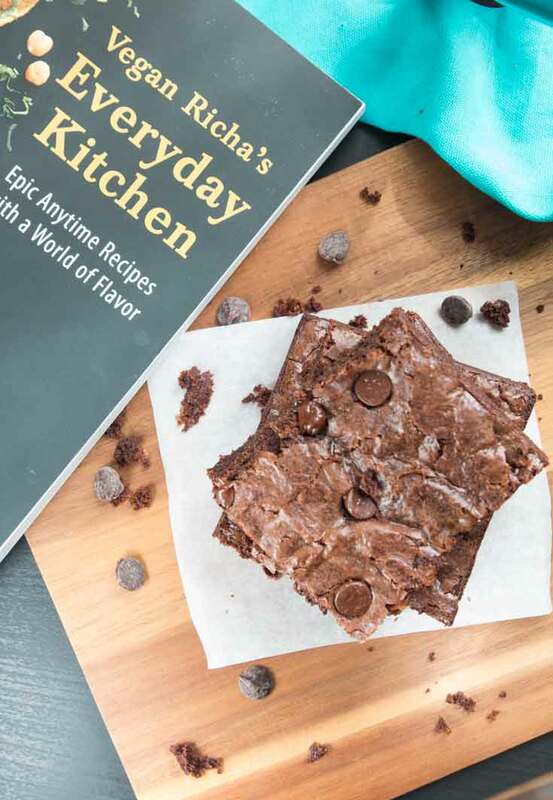 So I’m thrilled to be reviewing ‘Vegan Richa’s Everyday Kitchen’ cookbook, sharing Richa’s vegan brownie recipe, and hosting a GIVEAWAY because everyone needs a copy of this cookbook! 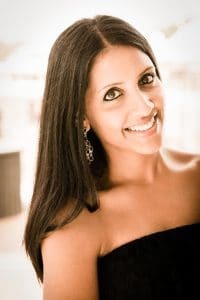 From her plant-based unique Indian dishes, to her twist on many other cuisines, Richa has extraordinary talent in the kitchen as shown through her site, cookbooks, and the pure variety of recipes she develops. She truly makes being vegan easy, and lucky for you, she’s come out with yet another amazing cookbook to show you how! While Richa’s first cookbook, ‘Vegan Richa’s Indian Kitchen’, established that Indian cuisine can easily be veganized well, this second book expands on that idea and veganizes many other cuisines. With this new cookbook, she has managed to use her Indian roots and transform everyday recipes into delicious meals. There’s something for everyone in this cookbook, and recipes you can make with ingredients that are pantry-ready. Richa couldn’t have put it better when she describes her second book as ‘Epic Anytime Recipes with a World of Flavor’. Even the cover makes you want to dive right in. Photo from Vegan Richa’s Everyday Kitchen, Copyright © 2017 by Richa Hinge. Used by permission from Vegan Heritage Press, LLC. ‘Vegan Richa’s Everyday Kitchen’ cookbook is unique, because its chapters are organized by the sauces that are used in the recipe. Richa believes that if you think “sauce first”, then you can create a new delicious meal everyday. Her cookbook starts out with a chapter on Peanut Butter & Coconut, featuring recipes such as Red Lentils in Peanut Butter Sauce and Green Curry Fried Rice. Her Sweet & Sour chapter features dishes such as Teriyaki Lentil Balls, Kung Pao Lentils, Hoisin Mushroom & Tofu Stir Fry, and Manchurian Chickpeas and Broccoli. The Masala & Saag chapter is one of my favorites, with Tofu and Vegetables w/White Masala Sauce and Cauliflower Chickpeas in Berbere Sauce. The Buffalo & Firecracker recipes are for you spicy lovers out there, and include Firecracker Jackfruit Sandwiches and Buffalo Chickpea Tacos. The Burgers & More includes a variety of mouthwatering dishes such as Quinoa-Mushroom Burgers, Kidney Bean and Black Bean Harissa Burgers, and Chickpea Barbecue Loaf. The Bowls & Hands chapter includes delicious comfort soup recipes, bowls such as the Buddha Bowl with Nacho-Spiced Sweet and Potatoes, and wraps. Tempeh Broccoli Wraps with Jalapeno Popper Cream??? Yes please! Photo from Vegan Richa’s Everyday Kitchen, Copyright © 2017 by Richa Hingle. Used by permission from Vegan Heritage Press, LLC. 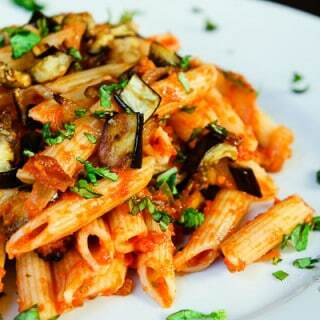 If you have seen Richa’s drool-worthy Italian creations, you know that’s one of her fortes. The Deep-Dishing section is another favorite of mine and includes many classics with a unique twist. Mushroom-Jalapeno White Pizza, Makhani Vegetable Pizza, Spinach-Artichoke Lasagna with Cauliflower Alfredo, and Broccoli Casserole with Bharat. She even includes her own easy Vegan Mozzarella recipe that’s to-die-for! And of course who doesn’t like Breakfast for Lunch?? Chickpea Chilaquiles, Lentil-Vegetable Frittata, and Samosa-Stuffed French Toast!!! The One a Sweet Note chapter includes more than 20 jaw-dropping desserts of all kinds, from Tiramisu Fudge bars to Salted Date Caramel Chocolate Pie. The cookbook ends at Everyday Basics with Easy Pizza Dough and Chickpea Flour Tofu, and a chapter on her Everyday Kitchen staples to help stock your pantry with essentials. All her recipes in the cookbook have bold flavors and offer allergy friendly substitutions and variations, like her Peanut-Free Peanut Sauce, Nut-Free White Garlic Sauce, and Gluten-Free Pizza Crust. And don’t let the long or unfamiliar ingredient lists fool you for even a second! My favorite things about her recipes are that they are all very easy to follow and don’t require a lot of time or effort! She guides you through every step and her instructions are very precise, easy to follow, and clear. This cookbook will inspire you to get into the kitchen and create dishes with flavors you never thought you could recreate! It was tough choosing a recipe to share from her cookbook. My eyes immediately went towards the Black Pepper Cheesy Mac and Broccoli (obviously), but I decided to go with what my kids were in the mood for at the moment, and it was hands down Richa’s vegan brownie recipe (as expected ha)! Plus, it’s been awhile since I actually baked rich chocolate brownies in our house. Richa’s vegan brownie recipe was extremely easy to make and only took 10 minutes to prep. They’re fudgy, rich, and super chocolatey, especially since the chocolate chips are melted straight into the batter. I love that she used spelt flour or whole wheat flour, since they are my go-to flours when baking. This recipe also works amazingly with her gluten-free flour blend. Next time I’m planning on swirling in some peanut butter on top. As a food blogger who is constantly creating, it’s not often that I reach for another cookbook or browse the internet for new recipes to try. With that said, Richa’s cookbooks have become a go-to for me when I’m looking to try something new and take a break from creating myself. I know I’m guaranteed to find a delicious mouthwatering vegan recipe that’s not only easy to make, but also healthy, made with whole foods, pantry-ready ingredients, and family friendly! 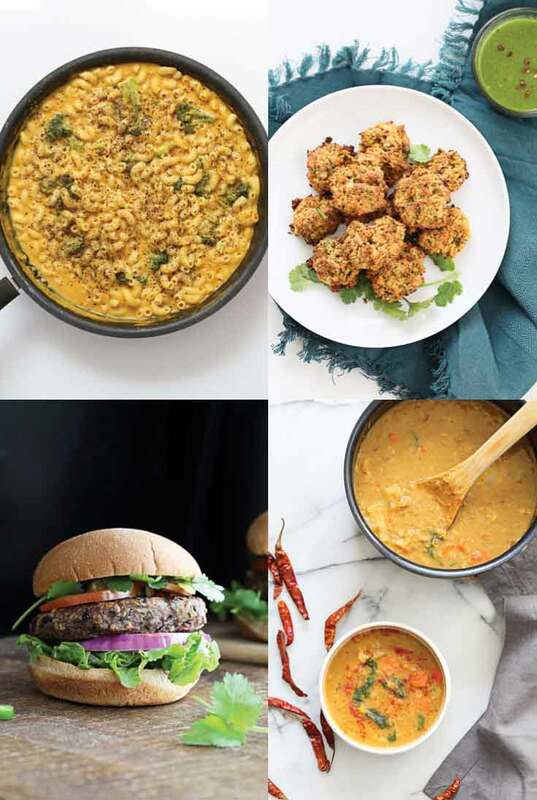 Next on my list to try are Mac n Cheese, the Easiest Black Bean Burgers, Buffalo Chickpea Tacos, Crispy Kung Pao Cauliflower, Red Curry Soup with Red Lentils, and Mushroom Matar Masala! For a chance to win your very own FREE copy of ‘Vegan Richa’s Everyday Kitchen’, enter the GIVEAWAY at the end of this post. If you can’ twait to get your hands on it (and I don’t blame you), you can purchase it here. 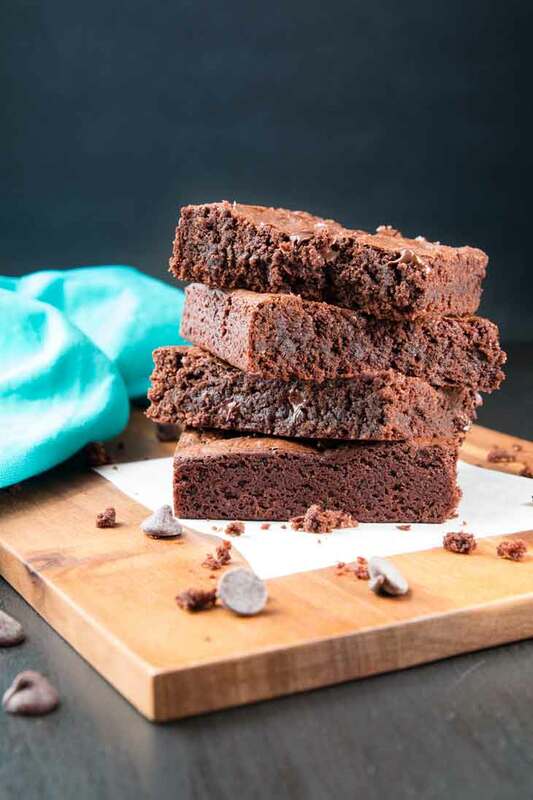 Until then, try out Richa’s vegan brownies from her new cookbook and let me know what you think! Preheat the oven to 350°F (180°C). Line an 8 x 8-inch (20 x 20cm) baking pan with parchment paper (or grease it well). In a medium microwave-safe bowl, heat the milk to almost boiling in the microwave (alternatively, heat the milk in a medium saucepan over medium heat). Add the chocolate chips, let the mixture sit for 1 minute, then whisk to melt the chocolate, about 1 minute. Add the oil, flaxseed, cocoa, salt, and vanilla and whisk well. In another medium bowl, whisk together the flour, baking powder, and baking soda. Add the flour mixture to the milk mixture, stirring to combine. Add 3 tablespoons (30g) of the chocolate chips. Transfer the batter to the baking pan and spread it out evenly. Add the remaining 1 tablespoon chocolate chips on top. Bake the brownies for 30 to 32 minutes, or until a toothpick inserted 1 inch (3cm) from the side of the pan comes out almost clean. The center should have a dry top but it might be battery underneath. Do not overbake. If a toothpick inserted in the center comes out clean, the brownies are overbaked and might be chewy. If the brownies are overly chewy, crumble them and use them in parfaits, cookies, or ice cream. Store the brownies in an airtight container for 2 days or refrigerated in an airtight container for up to 1 week. Warm and serve. I personally used unsweetened almond milk, whole wheat flour, and grapeseed oil when trying out this recipe. I baked for exactly 30 minutes as the recipe suggested and they came out perfect! If not using GF flour blend, be sure to add in the cornstarch as mentioned in the ingredients above. Open to US residents, must be 18 years or older to enter. The winner will be notified via email and announced in this post and in the comments of this post. The giveaway starts NOW and ends midnight October 17th, 2017, Eastern time. Good Luck! These look insanely delicious! I love her veganized punjabi dishes. I love a good brownie and these look delightful! They're so delicious!! It's the perfect brownie. My favorite Vegan Richa recipe is her lentils in a peanut sauce! My fiance requests it a lot and it's a great way for me to sneak in extra veggies. Being a potato lover, I'm really looking forward to the Samosa Potatoes in this new book. But those brownies look amazing too!! I have yet to try that recipe! Good luck with the giveaway! I really want to try and make vegan brownies. I wonder if they turn out as fudgy as the non-vegan version. The pictures are great! thank you!! I only went vegan about 5 years ago and I can tell you that they are just as amazing if not better than most vegan and/or non-vegan ones i've had growing up! you totally need to try them. I'm sold! I love fudgy brownies :), but I'd probably first try the Kung Pao cauliflower! These look so delicious. I love that is it vegan and won't feel as filling. These brownies look so moist and delicious! And I love that they're vegan, too! This book sounds awesome! vegan or not, these are hands down some of the best i've had! Thank you for the wonderful review Anjali. the brownies look perfect!! Thank YOU for creating an awesome new cookbook! BTW...these brownies will now be my go-to! 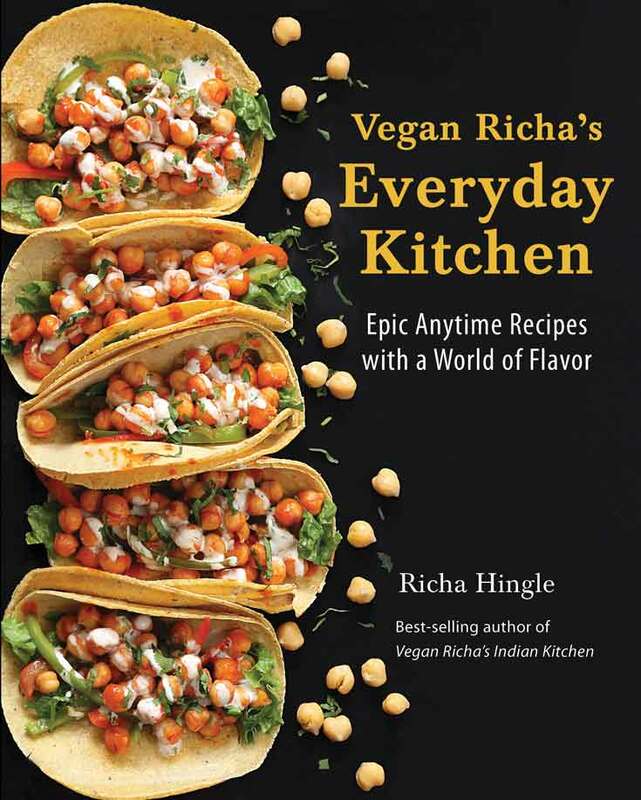 I love Vegan Richa, I can't wait to check out her book! 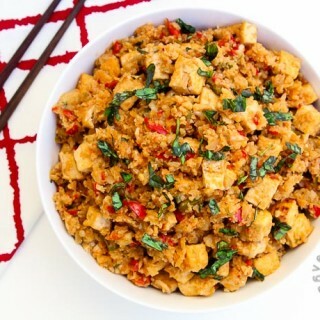 Crispy Kung Pao Cauliflower sounds delicious! Thanks for the giveaway! Easiest Black Bean Burgers... yum yum! These brownies are seriously making my mouth water! They look amazing! I love her PEANUT BUTTER CHICKPEA COOKIE PIE recipe. Ahhh I just LOVE Vegan Richa!! Can't wait for her new cookbook. I bet these brownies don't disappoint! I looove richa. I make so many things from her Indian cookbook, there's truly too many to name. This one looks superb as well! It's so hard to choose. I love her saag paneer, the mango tofu curry, chana masala; but I still remember vividly when I made gulab jamun. It was just as I recalled from my pre-vegan days. The saffron infused syrup, the smell of cardamom, the richness of it all. It was divine. And now writing about them made me crave those subime jamuns. Oh i NEED to try making her jamuns!!! The Black Pepper Cheesy Mac and Broccoli sounds amazing, but I will definitely try the brownies. Congrats to Diana W. for winning the giveaway!! Thanks everyone for entering and hope you get a hold of a copy of the book for yourself! It's awesome! Can I use normal all purpose flour 150gm and normal cow milk 120ml or do I have to use skim milk only or non dairy milk only? Yes you can use all-purpose flour. As for the milk, this recipe has only been tested with non-dairy milk. I'd recommend any unsweetened cashew milk, almond milk...they are available at almost all stores! These brownies are to-die-for so hopefully you try them out! Just made these and, while delicious, I feel that they are a little on the dry side. Do you think increasing the milk to 1 cup would help? Thanks! Hi! So after reading her recipe before I made them, I made sure to be on the caution of under baking them vs over baking so that they aren't dry or chewy. I've made these several times and found that sweet spot...the time I listed on the recipe worked for me! But ovens are definitely all very different and may be calibrated differently. Perhaps try baking them for a shorter time? They will finish cooking while cooling. The other thing Richa recommended if they end up dry or chewy is to crumble and use them as ice cream topping. But of course, I love her brownie version so much better! Perhaps try shortening the bake time! These are my families go-to brownie recipe now and they're always super moist and fudgy. Hope that helps! Hmm...I'm not sure what went wrong...what you mentioned about the AP flour and cornstarch is correct. The batter should be thick but definitely pour-able into the pan prior to baking. This is my friend Richa's recipe from her cookbook, and she has said AP flour should also be just fine in this recipe. 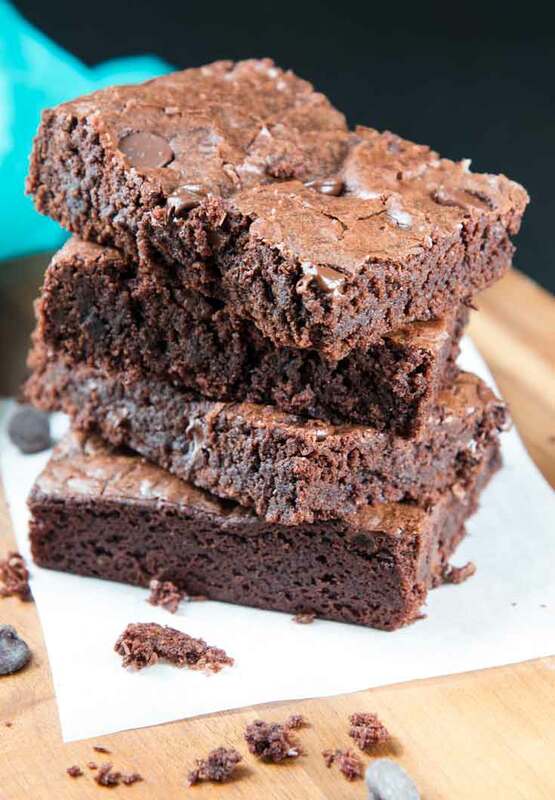 I've made it several times and it's become our staple brownie recipe and turns out perfect everytime...so not sure what went wrong :( maybe worth one more try? Is there a sub for the flax seed? This is Richa's recipe from her cookbook, but she said you can use chia seeds or omit them! The brownies were amazing! I was so surprised because so many of the vegan brownie recipes have not worked for me. Thanks. That's so great to hear Crystal! Thanks so much for trying it out and letting me know what you think!